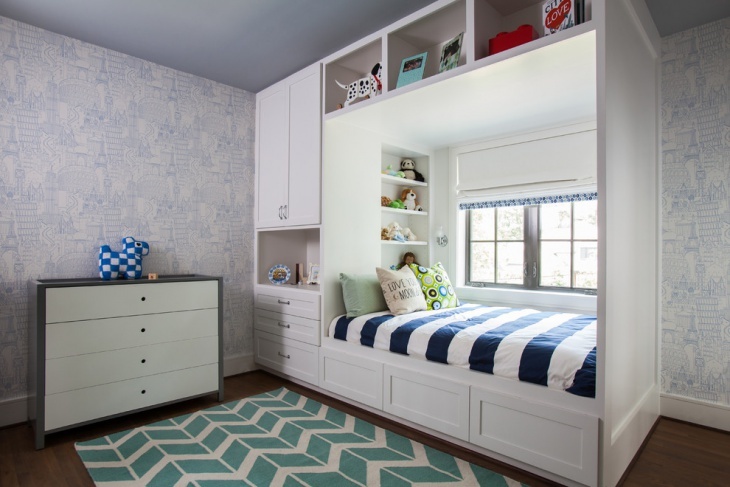 Looking for ways to make your kid’s bedroom more organized? Well, most parents go through this ordeal. 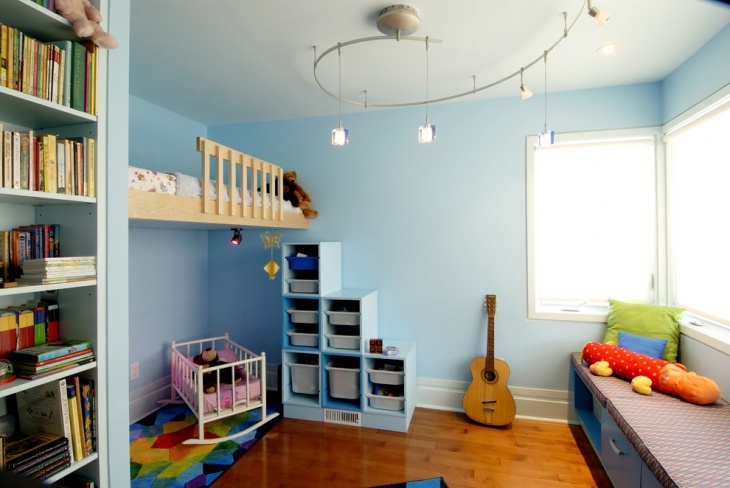 A kid’s bedroom can be the most unorganized space in the households. Obviously, you cannot deny a kid of his/her playthings or expect them to replace their clothes and toys at proper places! However, to make things easier on your part, you can plan on some unique storage ideas and spaces that would make cleanup easier. Let’s take a look at some unique ways parents have been helping their kids maintain a clean space! A bed is perhaps the first thing you would look up to when it comes to organizing things in a kid’s bedroom. 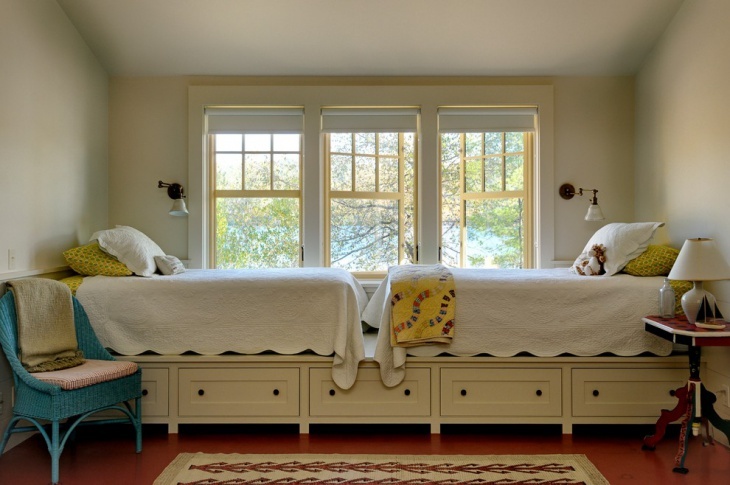 As perfectly shown in this example, the bed here is designed to have cabinets both under and on the sides. Anything that has been thrown around can be thrown back into these cabinets to create a safe and clean play space. The previous storage idea can also be ideally applied to bunk beds. Here, the lower bed is set on top of a series of drawers that should be ideal to keep all the sheets, bedding, and fresh clothes. To add to the storage needs, you also have a wall mounted cabinet. 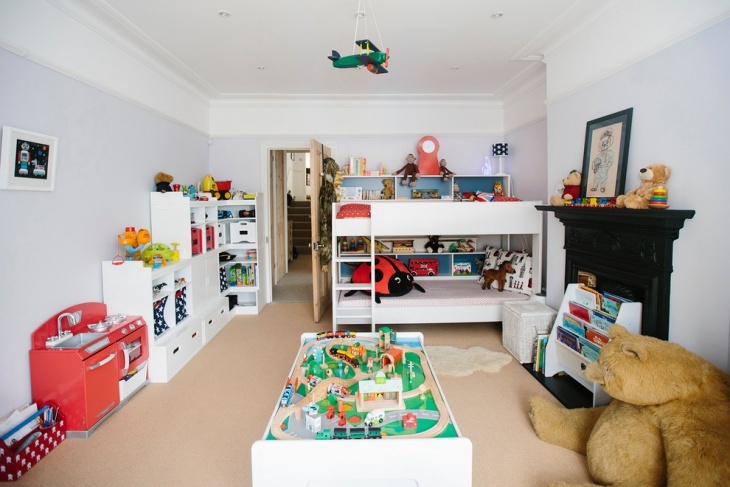 This is a perfect example of how to maintain a highly spacious room for your kids. With minimalistic furniture, you have the entire floor space free for play. The storage goes under the bed with enough space to store all kinds of items. If you have a single loft bed for your single child, you automatically get enough floor space to install a cabinetry. This example is especially relevant to small rooms. The space that would have been taken up by a normal bed now acts as a storage cabinet. The loft bed does also make things interesting for the kid. 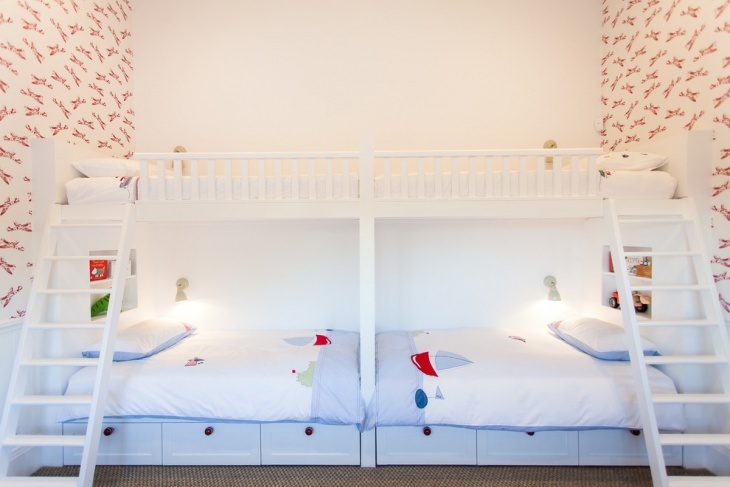 If you are looking to have two beds in a single bedroom space for kids, it is ideal to make it higher and use the space below for storage. As understandable, installing two beds will already take up a lot of floor space and you might not want the remaining floor space to be taken up by a cupboard! Under the bed storage solves the problem. A canopy bed is the ideal way of establishing a hidden storage space under the bed. The canopy design demands that you have long sheets hanging to touch the floor and curtains all around the bed. Well, use height to your advantage. This is another example of how you can use the under-the-bed space to leave enough room after installing a double bed. 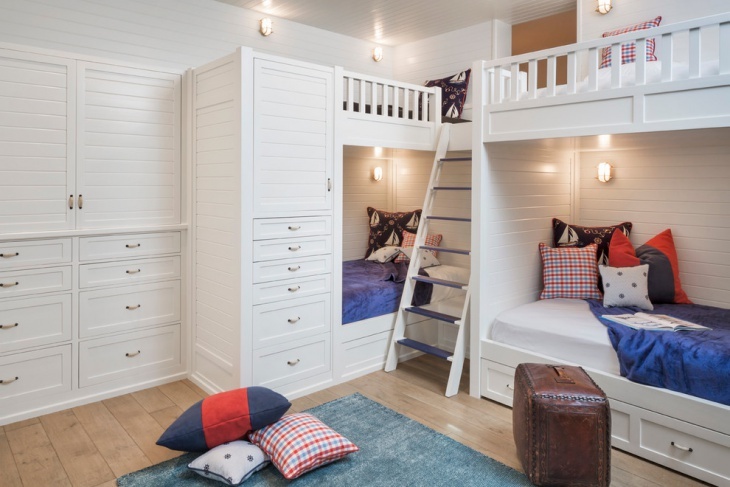 This arrangement is ideally suited for grown up kids who don’t want a loft. These beds are also safer and more comfortable. 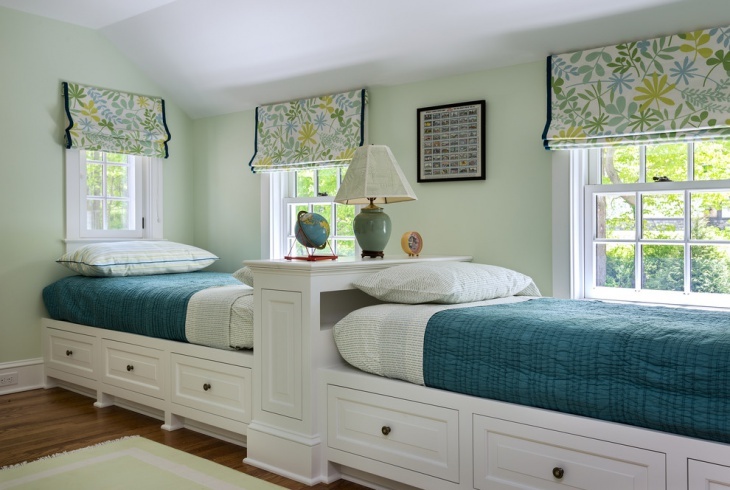 If you have more than one kid in your household, the ideal way to design a bedroom is an elongated space and cabinet beds. The shape of the beds here are in the form of storage cabinets, with drawers all over. 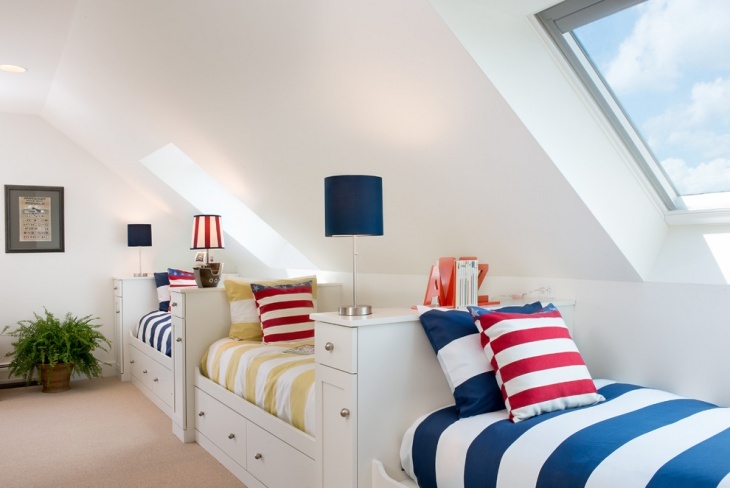 While these parents have used the attic space here to create the bedroom, you can use this design in any room of your household. Platform beds such as these leave a lot of space around for installing your cabinet. Here, the storage and the sleeping space have been fused into single furniture. Installed at one corner of the room also leaves a lot of space around. Now, here’s another really unique way to design your kids bedroom. The bed is like a stage that needs to be followed on steps! The wall art is a perfect illusion of the kid stepping into another part of the world altogether! Also, the raised bed creates enough space below to store all you want! Hope you have like our designs and have been rightly inspired to make your kids room more functional and fun. We would certainly like to see photographs of your kids playing in one of such spaces!